Paul Cook was satisfied with a Gillingham draw after Pompey ended their pre-season undefeated. Ben Davies struck the bar with a first-half free-kick at Priestfield Stadium today but otherwise a goalless draw was a fair result. 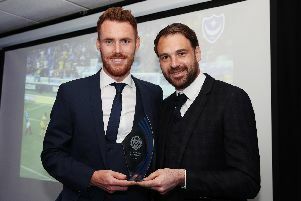 In terms of Pompey’s pre-season squad, it ensures they have now finished undefeated from all six of their summer matches. And afterwards Cook was pleased how the squad is progressing. He said: ‘It wasn’t a great game, in the second half it developed into a very bitty pre-season friendly. ‘I thought we had the ascendancy in the first half in a game of very few chances. ‘We managed to get minutes into all our players, the likes of Kyle Bennett, we are very much a work in progress - that is all there to see.